I like recursivity in acronyms such as GNU, which stands for “GNU’s Not Unix”, and also in cartoons. 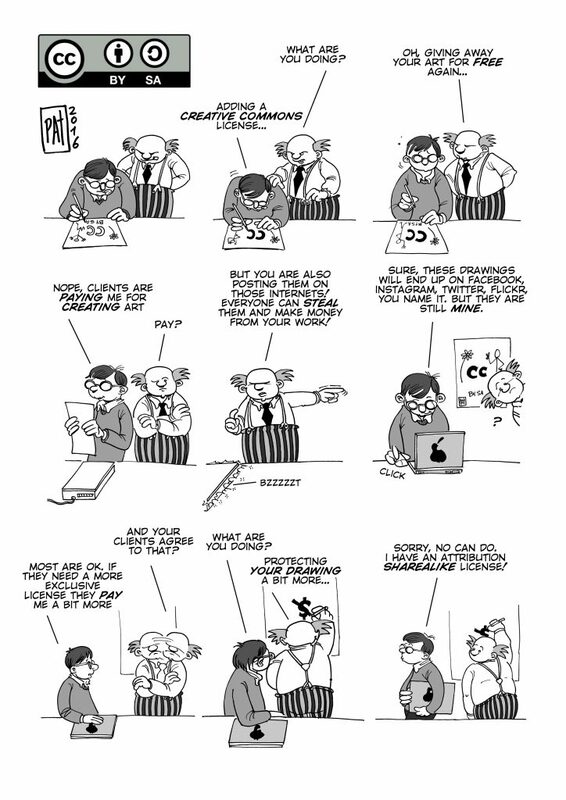 A recent example for a recursive cartoon is featured below, addressing a great number of issues regularly debated around the alternative copyright licensing standard Creative Commons. The author of the work is Patrick Hochstenbach, a comic artist, programmer, and digital architect at University of Ghent libraries. You can also find his work on Instagram and Twitter. Creative Commons means that some rights remain reserved, while others are granted to third parties in a general way. Creative Commons licenses do not mean that authors cannot earn money with their works. Creative Commons licensed works can be much more easily shared on various social media platforms. Copyleft licenses such as those with the ShareAlike module make it impossible to re-appropriate the work by third parties.